This class is easily testable with PHPUnit. Here @Render() annotation tells to the framework to use a twig template. Sometimes I think Symfony2 has all this features and developing this framework is a waste of time. Probably, but it’s cool to code it. Also it’s very easy and fast for me build prototypes. What do you think? Initial commit here (the code used in this post). 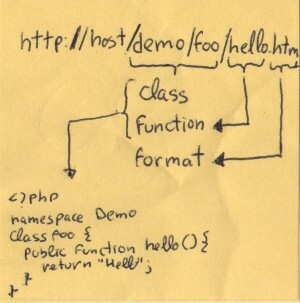 but without using class statement, adding the constructor and hello method dinamically. And that’s it. It works. probably with PHP5.4 we can drop the “$self” variable. It’s an ugly trick to pass the real instance of the class to the callback, thanks to the “Added closure $this support back” feature added in the new version of PHP. But at least now we need to it. And that’s all. As I said before probably this “Hybrid Classes” or “Runtime Classes” (I don’t know how to name them) are totally useless, but it’s fun to do it. PHPUnit 3.4.5 by Sebastian Bergmann. Building a client for a REST API with PHP. Today we’re going to create a library to use a simple RESTfull API for a great project called Gzaas. Don’t you know what the hell is Gzaas? Gzaas is simple idea idea of a friend of mine (hi @ojoven!). A simple project that creates cool mesages on full screen. Then you can share the link in twitter, facebook and things like that. Yes. I now when I explain it, the first word that appear in our minds is WTF, but it’s cool, really cool. Ok. The API is a simple RESTfull API, so we can use it with a simple curl interface. A few lines of PHP and it will run smoothly. But Gzaas is cool so we’re going to create a cool interface too. This days I’m involved into TDD world, so we’re going to create the API wrapper using TDD. Let’s start. The first version of Gzaas API is a very simple one. It allow to create new messages, and we also can list the whole set of styles, patterns and fonts availables. The idea is build something as modular as we can. Problably (I hope so) Gzaas will include new features in a future, so we don’t want to build a monolitc library. We are going to start with fonts. As we can see in documentation we need to perform a GET request to get the full list of available fonts. There’s an important parameter (nowFeatured) to show only the featured fonts (the cool ones). So we are going to crate a simple test to test our font API. Whith this test we’re going to test fonts, but we also can test styles and patterns. As we can see our library has a fluid interface (I like fluid interface). It’s easy to implement. We only need to return the instance of the object (return $this;) in each setter function. You can fork the code at github here. Feel free to browse the code and tell us what do you think?